JERUSALEM (CNS) — Latin Patriarch Fouad Twal said in the Jubilee Year of Mercy called by Pope Francis that mercy must include every person — both kin and foe. “In these days and time, we suffer from the absence of compassion in our hearts — as if the coming of Jesus Christ and the message of Christmas were in vain,” he said in his homily at midnight Mass at the Church of St. Catherine, adjacent to the Church of the Nativity in Bethlehem, West Bank. “Mercy, compassion and benevolence still exist throughout the world. Fortunately, not all people have lost their humanity,” he said, adding that mercy is not limited to just individual actions and relations, but is all-encompassing. Patriarch Twal celebrated midnight Mass after leading the traditional procession into Bethlehem and into the Church of the Nativity. 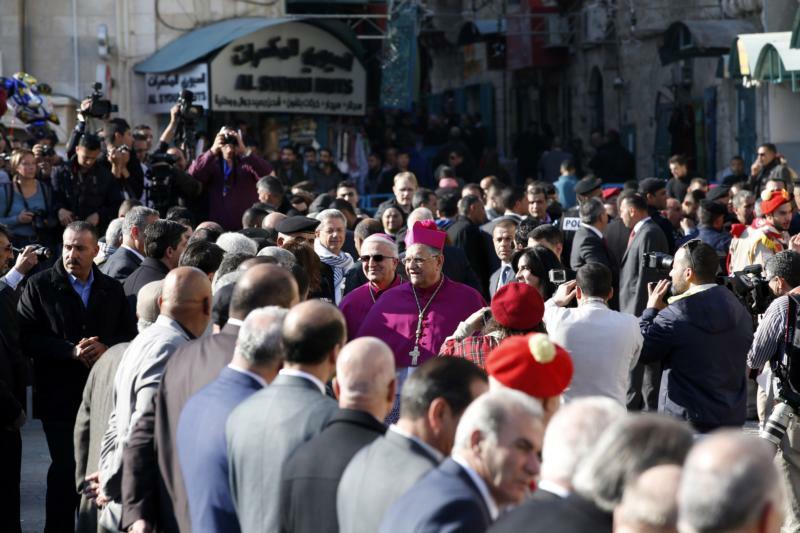 During Patriarch Twal’s traditional exit from Bethlehem on Christmas Day, his car was hit with stones thrown by Palestinians who were demonstrating against Israeli soldiers near Rachel’s Tomb, where the convoy passed by, said Jerusalem Auxiliary Bishop William Shomali. He said he did not believe the stones were thrown intentionally, and there was no damage to the cars. In the days leading up to the Christmas celebration, Palestinian police arrested 10 men, including some believed to be possibly planning attacks against Christian holy sites and pilgrims and others suspected of possible physical harassment of pilgrims in Bethlehem over the holiday, Bishop Shomali said. One Palestinian was arrested for burning a Christmas tree in the northern, largely Christian Palestinian village of Zababdeh. Bishop Shomali said this was unusual, since most Palestinian Muslims enjoy the Christmas trees, though some do not accept the public display of Christian symbols. In his homily, Patriarch Twal said that in a time when the world is becoming increasingly brutal, the faithful of all religions have the responsibility to nurture the seeds of mercy so that it becomes a “common culture” within public and personal life. “Seeds of mercy are entrenched in all religions that bind us with Judaism and Islam. Mercy is recognized as one of the most prominent attributes of God. Before being omnipotent, almighty, creator and supreme, God remains the all-merciful,” he said. “Consequently, we can work toward a new world, characterized by equality, peace, charity and mutual respect, so that mercy becomes a common culture within public and family lives,” he added. In celebrating the birth of Jesus at Christmas, people should remember that Jesus came to show the merciful face of God, Patriarch Twal said. Since violence flared between Israelis and Palestinians three months ago, Palestinian attackers have killed 20 Israelis, mostly by stabbings. Some 124 Palestinians have been killed by Israeli gunfire, 85 of whom Israel says were attackers and the rest during demonstrations.